There’s a beautiful triplet of objects visible low in the west-by-southwest, and it’ll be there for a few weeks. Saturn, Mars, and the star Spica are in conjunction. That means they’re close to same position in the sky — in this case, within just a few Moon-diameters of each other. And on the night of August 21st, they’ll be joined by a thin Crescent Moon. The quartet will form a nearly perfect geometric square. Here’s a photo of the triplet from a member of our astronomy club. Spica should show as a smaller point of light, because it’s so distant, but was diffused into a larger dot by atmospheric haze. Still, the photo nicely shows the contrasting colors of these objects. 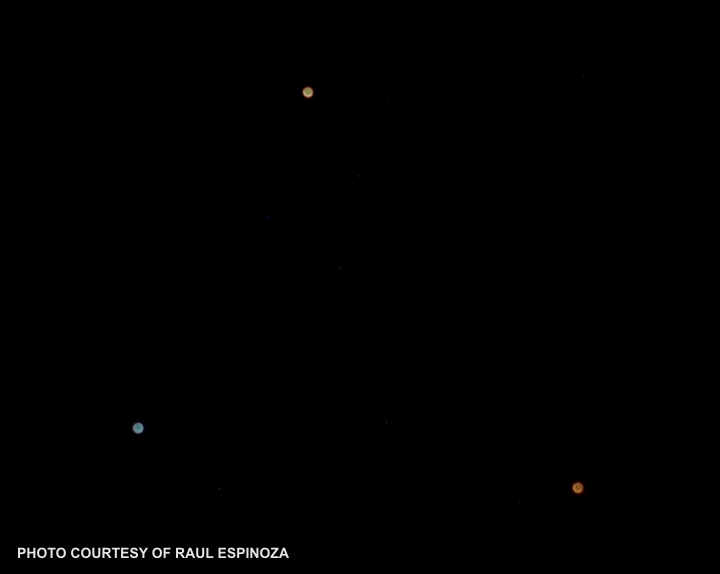 Taken on August 5th, Mars was then approaching conjunction. Click on the thumbnail to enlarge. Are you ready for an astronomy lesson? I try to keep Sky Lights around 500 words on average, but when we get into lesson mode it sometimes runs longer. Also, I often link to previous blogs and outside resources. So if you’re just browsing for basic info, ignore those links. If you’re trying to really understand the topic, follow those links and you will learn. The objects we’ll be talking about are easy to identify, since there’s not much else visible in the western sky right now. Unless you enjoy very dark skies, about all you’re going to see is what’s shown in the graphic above. New visitors might want to check out the FAQ for help reading our sky maps. If you watch the western sky for a few nights in a row, observing each night at the same time (8:00 pm), you’ll see three interesting effects. Understanding these effects is part of learning basic astronomy. First, all objects shown will slowly drift lower in the sky, eventually setting at the same time as the Sun. This apparent westward drift of the sky is due to Earth’s eastward motion around the Sun. The westward drift is about 1°/day for stars, or 360°/year. That’s why each season has its own distinct constellations of stars. Visualize Earth going around the Sun, and you’ll see how the “direction of night” changes over a one-year period. This diagram might help. Second, Mars will simultaneously drift in the direction indicated by the arrow, relative to Saturn and Spica. This motion is due to Mars’ faster west-to-east orbit around the Sun (compared to Saturn). All planets farther from the Sun than Earth move west-to-east relative to the stars. That is, unless they’re going through retrograde. The motion of Venus and Mercury is a bit more complicated, since they orbit the Sun inside Earth’s orbit. But if you want an extended astronomy lesson, check out my post from April 2nd 2012. 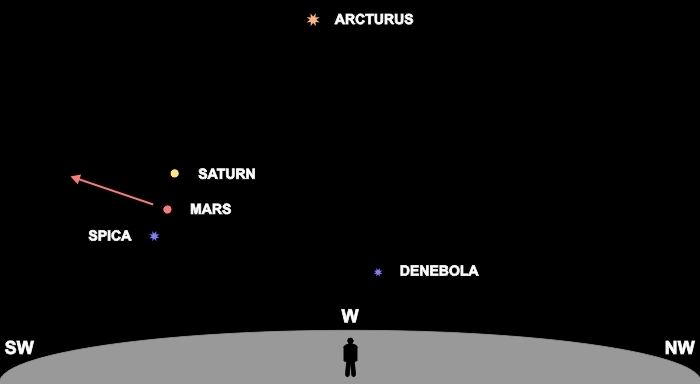 Third, note that Spica and Denebola “twinkle” more distinctly than either Saturn or Mars. If you want to understand why stars twinkle and planets don’t, read this post. Spica is 262 light years from Earth. Denebola is 36 light years distant. Saturn and Mars are much closer, so their light is less visibly distorted by our atmosphere. If you have a telescope, or even just binoculars, check out these celestial wonders. 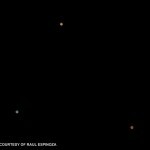 You’ll see that Spica and Denebola look like a twinkling points of light flashing multiple colors, but Saturn and Mars show visible discs with clearly circular shapes and more constant color. It’s optically harder for the atmosphere to “twinkle” a disc of light than a point of light. SPECIAL BULLETIN: Sometimes there’s just too much going on in the sky to cover it all in a weekly blog. Turns out that on Aug 11-13, we’ll be treated to the annual Perseid Meteor Shower. To learn more about that, read my blog from last August here. Since this is an annual event, most of what I wrote then is still relevant. But this year there won’t be a bright Moon interfering with your view of these celestial fireworks.